Maureen Amor tells us her story. 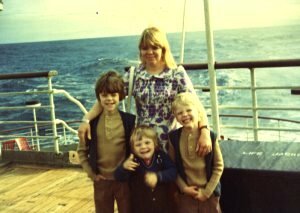 We sailed from Southampton on April 12th 1973 with our three young boys. We had never left our home town of Reading Berkshire before, so this was a big moment in our lives, All we owned were 2 suitcases and a small trunk. When the train pulled into the dock station we saw this beautiful white ship and everyone thought this was to be our ship... it was in fact the QE2!!!!!! As the train travelled a little bit further we saw the SS Australis, she wasn't as beautiful being painted grey, but to us she was awesome. Once onboard we were not disappointed. 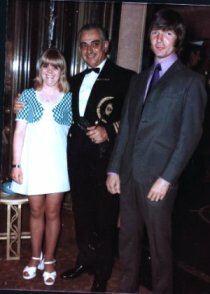 As we had not travelled before, let alone on a huge ship, we were going to enjoy every minute of our 10 pound voyage. This we did, joining in everything possible, for awhile I was even a member of the ships dance troupe. I loved it but Cliff got a bit fed up of being baby sitter while I was at rehearsal so to be fair I gave up my short-lived dance career and relaxed with my family. Cliff was a judge in the beauty contest and enjoyed all the perks that went with it, say no more! We made lots of friends and I enjoyed my nickname "lovely mummy" everytime I took the kids to their meal sittings. The crew were great people, very friendly and the waiters were fantastic in the way they served meals in rough weather with barely a drop spilt! On the dance floor it was great trying to keep balanced as the ship rocked when you rolled I was heartened one evening to see the Captain try and stay on his feet. It was said that he was the father of 11 children I don't know when he found the time! We spoke with John L Sullivan during our trip and he told us a lot about Adelaide where we were heading for. He was such a nice man always had time for a chat and what a voice, he was a gentleman. So many happy memories of our four week trip it has always been a very big part of our lives. We are all 30 years older now but as we have just learnt the fate of our "beaut Australis" having found Ken's great website. We have all enjoyed reliving our memories, and the grandchildren have learnt some of our history. What sadness to hear of her end, but what a joy to have known her. The photos and story above are courtesy of Maureen Amor.